This is probably partially forgotten nowadays, but the Eiffel Tower was, at the time of its construction, a fantastic landmark for all aerostats coming or going away from Paris. At the time, we speak of airships because aviation is just in its infancy, it is also the Eiffel Tower that will establish some physical laws on the resistance of materials, laws that will be implemented a few years later in aeronautics precisely. 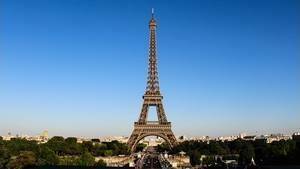 But in the late nineteenth century, it is as a landmark that the Eiffel Tower is convenient. Below is the text of Mr. W. de Fonvieille he made appear in "The Military Spectator" of July 15, 1890, he tells the night ascent of a ball in which he took place. It should be known that at its construction, the Eiffel Tower had a fixed headlight. This aerial communication between a balloon ascending and the third platform can be established in the simplest way, at least during the night, when we have done some experiments and that we will have acquired the essential practice. The experiments of June 20 establish this result in a very indisputable way. Devices including MM. Jovis and Mallet used in the experiment of 30 were formed of two lamps of twenty candles each, placed in a conical reflector with flat bottom, mobile about a vertical axis. The conical reflector could be directed to the side of the Tower that could be seen in the distance because of its searchlights and lighthouse. We followed the balloon until 11:30, when he was at a distance of 100 km, since he had passed Château-Thierry. It was easier to maintain the luminous point in the field of the telescope. The lighting of the nacelle can be performed very easily by better devices. It is enough, indeed, to take a parabolic reflector and to place in its focus a single lamp of a power equal to that of two lamps of the experiment of June 30, to be in much better light conditions. We have seen very easily the interruptions that M. Mallet has produced by occasionally covering the light with his aeronaut cap. It would have been much easier to discern these signals if they had been produced with a key Morse give instant interruptions and to which it is possible to print a certain rhythm. 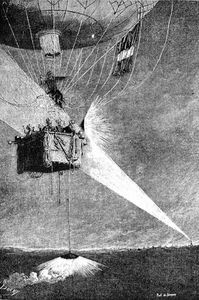 If we had wanted to send Morse signals to the aerostat, we should have been content with a single searchlight. 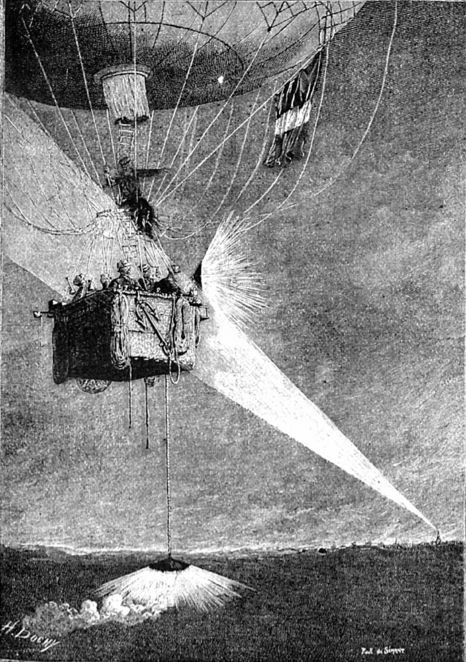 The illumination of the Tower would have been less brilliant, but the aeronauts would have had no difficulty in finding the Tower and seeing the signals it had sent. Indeed, the tricolor lighthouse, whose intensity is much less bright, remained visible until 1 hour, when the balloon was 150 km from the tower as the crow flies. It is good to add that examined with a binocular, it looked like a simple eclipse lighthouse. The blue rays and the red ray had been absorbed by the atmosphere. On its own and without any other help, the Tower lighthouse can serve as a signal to guide an aerostat on a nocturnal ascent, which would seek to run vertical stripes in the air, in order to approach Paris, or to move away from it. in a given direction in advance. An aeronaut who, having left Paris, would like to come back to it, would easily be able to discern the current that would be suitable for him to run along the circle of 100 to 150 km radius. Often, if the favorable wind leaves him, he will be able to discover in the accessible region of the air several currents to which he will be able to abandon himself alternatively to rectify his route. During the day, the Tower will also be of great service to air travelers, but it will be seen at much smaller distances. It is especially during the night that his services acquire a surprising range. One could also, to a certain extent, think of optical telegraphy without waiting for the evening. Unfortunately, how many pains for a flash of sunlight to strike the eye of a traveler occupying a seat in the nacelle! It must be said very loudly that the art of aeronauts, that of astronomers, must especially be exercised during the night. Indeed, air navigation is generally much easier and safer when you do not have in the sky this huge disrupter that is called the sun. The light given by the moon, especially when it is close to its full, is very good enough to recognize an infinity of details. When the Moon is absent, electricity allows all maneuvers to be executed. It was certainly at night that I made my most interesting climbs, long before the Eiffel Tower came to lend the help of its lighthouse and its projections. A fully armed balloon must even have the means to illuminate the ground and to launch, if necessary, luminous probes that make it possible to see everything that is happening on the ground. The aeronaut's eye acquires a very great sensibility, and even at a considerable height, he will perceive very well the details contained in the circle of illumination of his nacelle. To take advantage of the lights that he can walk in space, it is necessary that the lamp used for the projections of light never strikes directly his pupil: if he is endowed with a good view, and if he possesses instruments optics accommodated to these new arrangements, it can really accomplish wonders! Let us add that the electric current produces a heat which can be used in the fight against the cold, one of the greatest enemies that man has to fight in the conquest of the air. We see, then, that if electricity does not possess a motive power sufficiently light to fight against the wind, it may be of immense use in celestial excursions. It was the first flight of a device heavier than the air around the Eiffel Tower. 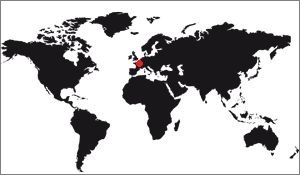 The feat was done by the Baron de Lambert, a Frenchman, who was flying a Wright aircraft, all in wood and canvas. It happened on October 18, 1909, it was the very first steps of aviation, and it was the first time that visitors to the tower could see such a device turn around. This flight was more of a test run of modern aviation than a step forward in the knowledge of science, but it still marks a milestone. Sad story that of Leon Collot, aviator of his condition that made talk about him at the same time as the Eiffel Tower. In 1926 he took control of his plane and flew to the center of Paris, lined up on the Eiffel Tower and passed underneath. Real feat at the time when the navigation was done with the eye, exploit which would have been one if the pilot had not unintentionally struck a TSF antenna, causing its deviation, an accident and consequently its death. When aviation developed, it needed ground-based lighting and guidance. But the technologies progressing slowly, in 1952, what was needed above all was a beacon visible from very far for the markup. That's why the tower received a long-range lighthouse at its summit. He had just replaced that of Mount Valerian, destroyed during the war, and will remain in service until 1974. 1954 : Installation of a radar by the allies. Two years later the allies are once again interested in the Eiffel Tower. In order to control the airspace, and 50 years after the first air navigation tests for airships, they install a radar at the top of the tower to secure the sky around the capital.